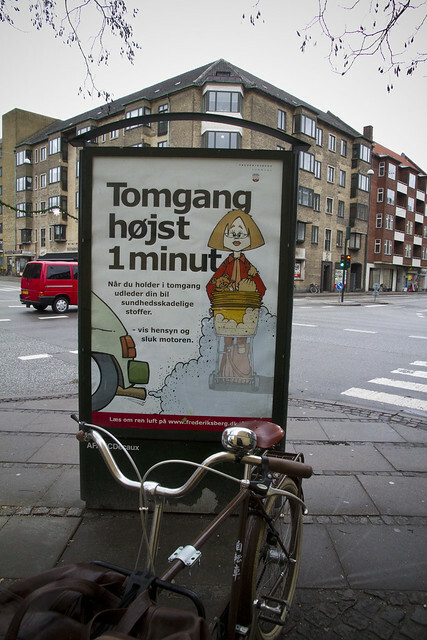 These posters are up all over the city of Frederiksberg at the moment, where I live. They read, quite simply: "Idling your motor - Maximum 1 minute - When you idle your motor your car emits chemicals dangerous to health. Show consideration and turn off your motor." Hmm. Your car does it. Like it's alive and has a mind of it's own. Why, oh why, can it not just state that YOU emits dangerous chemcials when YOU idle your car? It's the motorist who is doing it, controlling the situation. Let's slap that responsibility on that motorist with a simple rewording, for god's sake. With THAT said, there have been rules in place for many years in Danish cities regarding how long you can idle your motor. They don't apply to traffic jams, but just when you're sitting there... um... idle. 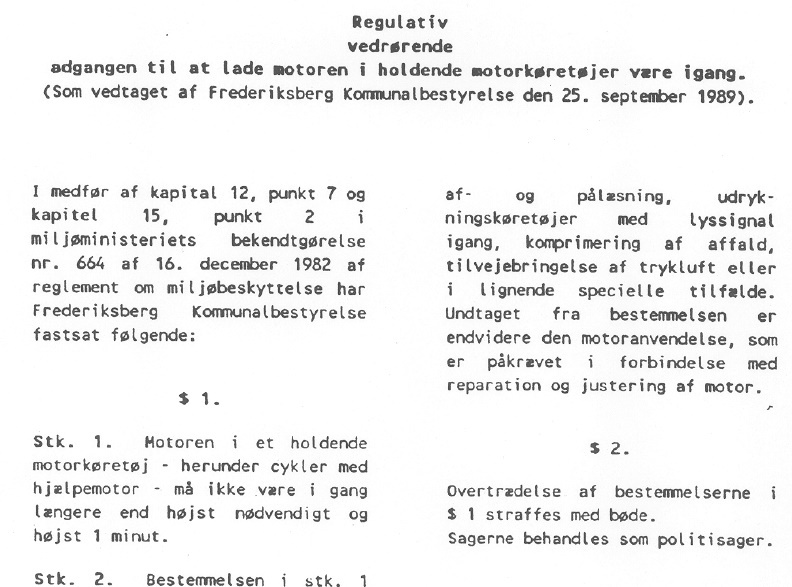 The regulations in Frederiksberg for this one minute limit have been in place since 1989, based on recommendations from the Environment Ministry back in 1982. Pollution comes from various sources. Power stations, wood burning stoves and traffic among them. Frederiksberg states that 90% of the pollution in this city comes from cars. If this hadn't been the regulation since the late 80s, I doubt that it would be put into place today, given how car-centric things have become. But it's nice that it's there.